Rep. 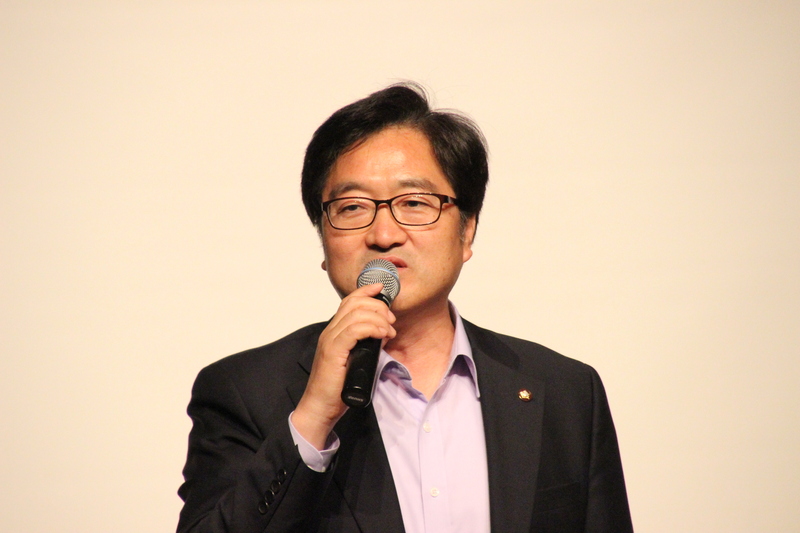 Woo Won-shik is one of the most active politicians in Korea. He devotes himself to lending an ear to the weak as part of his mission to do everything he can to protect subcontractors. The Euljiro Committee, which he heads, was established with the goal of protecting subcontractors from contractors’ abuse of power. It is one of the most active, successful bodies belonging to the opposition New Politics Alliance for Democracy (NPAD). Rep. Woo heads the committee, marking its second anniversary. The name of the committee means the protection of the “eul,” meaning subcontractors. In the past, subcontractors did not find it easy to meet lawmakers at the National Assembly, but things have changed. Rep. Woo said it is the committee that has broken the mold and that is the rationale in establishing the committee. Rep. Woo spearheaded the establishment of the committee in the wake of a 2013 incident in which Namyang Dairy Products Co. headquarters resorted to a hard-sell strategy to unload unsold products to franchise business owners irrespective their ability or capacity. True to his tenet, “The field is the key to solving any issue,” he toured sites of the conflict between the contractor and subcontractor to address the issue. For the past two years, the committee has handled some 700 issues by holding news conferences, seminars and touring sites. Fifty conflicts have been solved. Rep. Woo stresses the significance of personally visiting the sites in question to hear the subcontractors’ voices, rather than resorting to the conventional method being employed by existing political establishments. He does not resort to a means of cornering management one-sidedly, and his committee’s goal is to give both management and labor room to talk issues through. Rep. Woo, reelected to the 19th National Assembly, has held such prominent NPAD positions as party deputy floor leader, deputy secretary general and senior vice floor leader. He also served a member of the party’s Supreme Council under the control of former chairman Kim Han-gil. Rep. Woo’s capacity as the chairman of the committee has contributed to his ascending to one of powerful politicians. Rep. Woo added that he would like to see economic democratization forces and the likes of subcontractors join the ranks of the NPAD. And the Uljiro Committee will do its utmost to gain power. Rep. Woo boasts of the committee’s commitment to supporting subcontractors. He stresses the need to transform NPAD into a kind of Uljiro Party. A descendant of the scholar Woo Tack of the late Goryeo Dynasty, Rep. Woo sits on the National Assembly Environment and Labor Committee as an environment expert. A master’s degree holder in environmental studies from Yonsei University, Rep. Woo was involved in diverse environmental activities, holding such positions as member of the steering committee of Civil Alliance for Environment. He also headed the “People’s Movement around Jungnyangcheon Stream Loving Environment,” before being elected to a lawmaker. One of the parliamentary activities he has achieved as worthwhile is the passage of a revision bill of the Act on Facilitating the Employment of Handicapped People and Vocational Restrictions. One of Rep. Woo’s relatives gave up entering a university due to physical handicaps. He led a revised bill that would allow the physically handicapped to be hired as officials in such jobs as police officers, firefighters and national defense. The amendment bill gained approval from the National Assembly in 2005. He also spearheaded the proposition of such bills as the Act on Imposing Additional Penalties against Ex-President Chun Doo Hwan’s proceeds of crime; and legislation of the three labor acts related to super-short term employees.